...Buhusi [pronounced Boo-hus]. 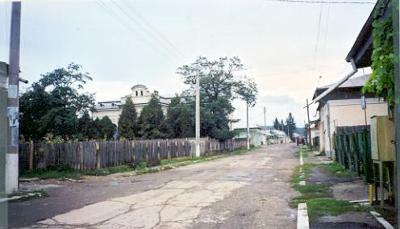 A walk of several blocks beside the railway line, accompanied by a couple of chattering young Roma children, before turning towards the centre of town, up a hill to the right. Many horses and carts passing by at a trot, the horses’ hooves clicking sharply on the road, their legs lifted high, almost prancing. The centre is mainly apartment blocks, but down in a little hollow to the left there are some old style houses and allotments. Over the brow of the hill, beyond the modern buildings, and along a long straight street, uneven broken paving and muddy puddles, lined by colourful, low, shtetl-style housing, leafy gardens, and stern-faced old ladies in smocks, thick stockings and scarves, peering over their gates at me. Half-way up the street, called Str. Ion L Cuza, on the left, is the schul, adjacent to a large shady garden, all enclosed by a wooden picket fence and a locked gate. 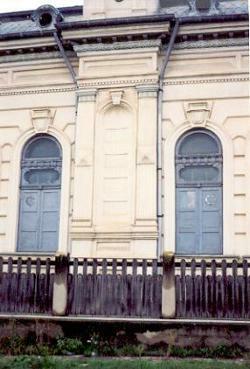 The synagogue has a grey tiled roof, ornate cream exterior, and blue-grey shuttered, arched windows with the same Mogen David designs as seen on the schul at Piatra Neamt earlier in the day. A large building, but no outbuildings as seen elsewhere, although there seem to be smaller rooms at the back of the schul, judging by the level of the windows. 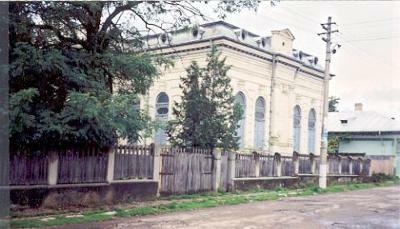 The synagogue was built in 1859, and has been fully restored since it was damaged by local youths in the 1980s, who broke in thieving, and set fire to a room. According to the guidebook notes, the frescoes and other painted decoration glow with bright colours. Lit by the sun streaming through its big arched windows, the lofty square sanctuary is decorated with naive wall paintings depicting zodiac symbols representing the months of the year and imaginary landscape scenes, including dreamlike visions of the Holy Land. The Aron ha Kodesh, again in a style typical for Moldavia, is a joyously ornate carved fantasy in brightly painted wood, incorporating gilded rococco elements, tromp l’oeil painted curtains, and typical symbols such as the Ten Commandments and hands raised in priestly blessing. I continue up the road, as it gets increasingly muddy, following an old lady with a shopping bag. We get to the top, a fine view over the valley below, and walk together. I ask her if she knows where the Jewish cemetery is, but she doesn’t seem to understand completely. She realises I’m looking for something religious, but thinks I’m searching for a basilica. I find out later that there is a basilica over the next hill, out in the fields. Crossing herself, she says she’ll show me. I stress `cemetery’ again, wondering if she has understood. `Da, da,’ she nods assuredly. As we head off across the fields, she asks me to sing, but I’m at a loss to know what to sing. Through a meadow, between some pine trees, her cold rough hand in mine, as we help each other over the very muddy patches. Across another meadow towards her farm, her horse tethered there, and her geese rushing to greet her, honking endlessly. Geese are better than guard dogs, and can be equally aggressive. I search everywhere, but cannot find the cemetery. According to my guidebook, it is on a hill at the end of an extremely bad, muddy road, [impossible to find without the help of the local community.] And that it seems to be at the end of the world as if on the edge of a forest clearing in some long-ago century. Describing the cemetery, the guidebook said that, a gnarled peasant, the caretaker, lives in a small cottage with his mentally handicapped, grown-up son. Smoke curls from the chimney. The old man, astrakhan hat jammed above his weathered face, followed us closely as we walked among the graves, stone to stone. Under his arm he carried a whisk broom. But for the absence of the cemetery and the caretaker, it certainly feels like the right place. It really does have that `end of the world’ centuries-old atmosphere. Disappointed, eventually I head back down the hill and through the town, and on to the railway for the trip back to Bacau. Jewish settlement in Buhusi may date to the late 1500s, but they were formally invited to live in the town in 1823 by local nobility. 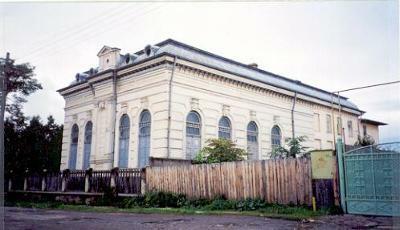 The town later became a centre of Hassidism, as the court of Reb Isaac Friedman [1835-1896] of the Ruzhyn dynasty. His tomb is one of those in the cemetery I couldn’t locate. Before WW2 the Jewish community of Buhusi numbered in the thousands, and afterwards, having survived the war, most moved to Israel leaving only a handful of elderly people remaining.